In this episode, I’ll talk about using muscle testing to get answers. 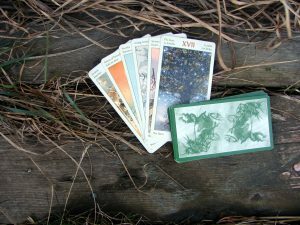 You’ll also hear about one of my Tarot readings. I’ll talk about the uses for Chives, and I’m going to give you a prompt, something you can do easily and in a short amount of time, to get some magic into your day. If you’re not used to Tarot, runes, a pendulum or another divination tool, you can try muscle testing to get answers from your subconscious. It can work really well for any kind of question whether it’s yes or no answers, or a short list of choices. Make sure to test what is a positive and a negative for you. It might be completely different from what other people say. Muscle testing can be done in several different ways. In short, it means that you let your body react on signals from your subconscious mind and observe the difference. Anything that provides a noticeable difference works. Take your non-dominant hand and close the thumb and the pinkie to a ring. On your dominant hand put your thumb and index finger together, and place them in the middle of the ring. To test for answers, you pull your thumb and index finger apart, to put pressure on the ring. If the ring stays closed, it’s a yes, and if the ring opens, it’s a no. At least they say that. The indications may be different for you, so make sure you try it first with some questions you know the answer to. If you decide to try this, let me know how it worked out for you. You’ve had some difficult experiences with loss and pain. The difficulty and pain will soon be over and will evolve into something new. Your troubles will not be permanent. No more pain will come to you from that source. It can only get better from here. Analyze the situation and your responses, and learn from yourself. You’re being led to a situation that is better for you. Trust yourself. You may have to drop some of the things you hang on to, that don’t serve you anymore. The last card I pulled indicate that you may run into some obstacles, a loss of some kind, but don’t let it get you down. Express your emotions to those around you, holding back never did any good. It is time to accept the loss and then move forward with your life. You have a desire to manifest your dreams in the real world. You may be in the middle of a new project, or at the beginning of a new experience. Create clear plans for the pursuit of your dreams, and the actions that will lead you to achieve them. You need to remain focused on the practical things, keep your feet on the ground and not get carried away by more ideas. Your common sense and practical approach will lead you to finding a solution that works. Now is the time to start acting on all of those grand ideas that have been brewing in your imagination. You may need to consider expanding your skills, or learning completely new ways of doing things. Samhain (Sow-inn, also called Halloween, All Hallow’s Eve, Day of the Dead, and many other names.) is most often celebrated on the 31st of October, but it’s originally it’s Yule and the Autumnal Equinox when the sun is at a specific position in the sky. This is the time for endings and new beginnings. It’s the witch’s New Year. A quiet time when the veil between the physical and the spiritual world is at its thinnest and spirits can easily get through. A time to honor your forefathers and your foremothers and say goodbye to those who have left us during the year. The dark months start and the land prepares for its winter sleep. The days get shorter and darker from now on and to Yule. The time when the earth rests starts at Samhain. You celebrate the year that’s gone and the year ahead. You may light bonfires and perform rituals to honor those who have gone ahead of you. Today’s prompt is to set up an altar or another area with some of the symbols you associate with the upcoming holiday. I’ve started planning a new line of amulets, so I’ve decided to lower the price of my wool amulet bags to $25, regardless of the previous price. If you want to have a look at them, the link is in the show notes. That’s it for me for today. Thanks for listening to the Witch in the Valley Podcast. The next episode will, among other things, be about taking care of feet in boots. If you have any questions, just reach out to me at linda@lindaursin.net Remember to rate and subscribe to the podcast on iTunes.